A concrete introduction to an abstract idea is more important now that most students don't make their own toys, clothes, tools, prior to attending a class where trig is taught. They don't have experience in how lines and angles work to create triangles or what triangle may be drawn or may not be drawn. This model, made with a transparency film (produced from the master) and 3 number 8 clothing snaps, permits the user to rotate the arm containing side a as desired. A two-solution case is shown. 1st: Prepare and cut the film. Using your browser, print the master. Make a transparency of this master. Cut, with a razor blade, 6 square holes (3 at the end of side b and 3 at the end side a). Cut, with scissors, each of the outermost 3 side a arms from the trancparency master. Leave 3 duplicate side a arms in case a piece is lost. 2nd: Unsnap the clothing snaps. For each triangle, place the master film on top of the bottom clothing snap. 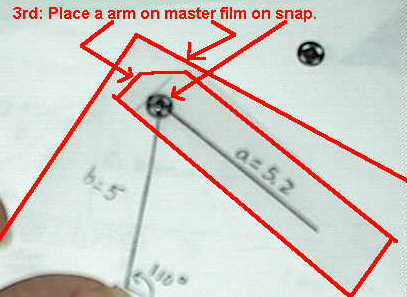 3rd: Place the a arm on top of the master film and clothing snap. 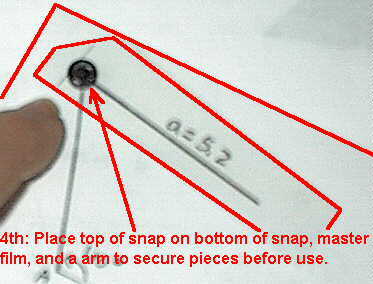 4th: Place the top of the clothing snap on the a arm to secure all pieces. 5th: Store the transparency film with snaps attached in a plastic notebook pocket or sheet protector. The model may be used both on an overhead projector or on a table. It is suggested that, if used on an overhead, a piece of paper masks the figures on the lower part of the film as the upper portion is used and explained. Rotate the a arms as	desired.